We have recently implemented a SMS (text message) service to remind customers whose bills are 15 and/or 35 days or more overdue. This is part of our commitment to improve our services. 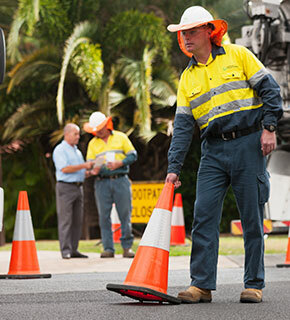 The service is being conducted in the following suburbs: Burbank, Carindale, Chandler, Eight Mile Plains, Mackenzie, Mansfield, Mount Gravatt, Mount Gravatt East, Upper Mount Gravatt, Rochedale, Wishart, Bracken Ridge, Brighton, Bulwer, Cowan Cowan, Deagon, Fitzgibbon, Kooringal, Moggill, Moreton Island, Sandgate, Shorncliffe, Bishop Island, Green Island, Hemmant, Lota, Lytton, Manly, Manly West, Mud Island, Port of Brisbane, Ransome, St Helena Island, Tingalpa, Wakerley, Wynnum and Wynnum West. Customers within these areas, whose bills are at least 15 days overdue, may receive an SMS reminder and, if their bill remains unpaid, a further SMS may be sent at 35 days. If you have any questions regarding the SMS activity or are having difficulty paying your bill and would like to make a payment arrangement, please contact us on 13 26 57 (7am-7pm weekdays). Why have I received a reminder for my bill? You may have received a reminder notice or SMS (text message) from us asking that you make payment of your latest bill. When we issue your bill, we print the due date for payment below the total amount due. We provide four weeks for payment to be made before we issue a reminder notice or SMS. Please be aware that payments can take up to 5 working days to reach us, if you do receive a reminder from us but have paid within the last 5 working days, you can disregard the reminder. If you made your payment before the due date and have received a reminder, please contact us on 13 26 57 (7am-7pm weekdays).